Oh come one, anyone that knows me from my dim and distant childhood will know that my conduct in school was exemplary, I always had an A, I was just too good to be true, so how come I had a B in my second year of junior school? I remember that teacher well, I think she hated me, actually, I think she hated all the kids, we were all terrified of her and I have written a tale about her before. It was a shock to be in her class, the previous year we’d had a kind softly-spoken teacher who had us all under control in a gentle and quiet manner and we missed her, the new teacher was a complete opposite, shrieking to gain command and with a hand that wasn’t averse to smacking. 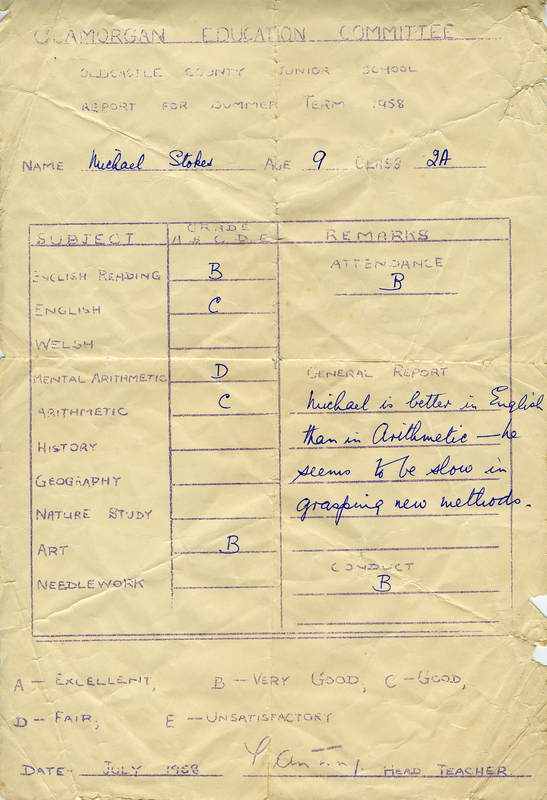 My reports for other junior years show I gained an “A” for conduct, and quite rightly too, I was so quiet and timid that I can’t imagine however I managed to drop to a “B”. The subjects however are a different story, usually getting-by in English and reading, but my arithmetic and mental arithmetic skills were way down low in the ratings, I guess I was just no good in school as I wasn’t interested in anything that was put before me. It got worse too, as in secondary school my report book degenerated into pages of abject misery and I have to confess I was usually unhappy with what I had to take home for my parents to read. School and I were just not compatible in any way, the one subject in which I was interested and reasonably good at was Art, we had a kindly teacher who was Latvian by birth and had experienced a difficult time during the war and ended up in Wales practising private physiotherapy from his home and part-time teaching at our school. I did well under his leadership but unfortunately he died during my GCE year and his replacement took an instant dislike to me and my work; I floundered and failed the all-important GCE. On my school report the latter teacher said I was an indolent worker, I’d had to look up that word at the time and was shocked by its meaning, I’d always considered myself good and enthusiastic at the subject, being meticulous and precise albeit a little slow; I guess that’s what she meant, misinterpreting slowness as laziness. I didn’t re-sit my Art “O” level, it was just too much hassle, and I left school with less than a handful of qualifications. The report book which had shown my progress, or lack of, over the years in secondary school was hidden away as I didn’t really want anyone to see it, and sometime in my twenties I burned it. Silly boy, imagine the fun I could have with it now! Wonderful that you have kept that. I have got several of my junior school term reports and like yours they don’t always make good reading. It’s only recently surfaced Andrew, was with some of my mother’s papers, also the years either side of this one. Mike, I’d been considering doing a similar post (and may still do) after looking through my old report cards (they were called cards, but were just A4 sheets of paper) recently and being surprised at what a thicko I seemingly was. In art, I always got an A for achievement, but sometimes a B for application, meaning that I was getting top marks for the results of my work – but without applying myself in class through the year. (That makes the As even more remarkable in my book.) Talking of teachers that hated pupils, there’s a post on my blog called ‘Tales to Astonish – but 100% true’, which may interest you. Thanks for the link Kid, have left a comment there! Your teacher was even more mean than one of mine, your tale might have given me some inspiration for another story though!